The January 2008 edition of NRICH was devoted to the mathematical topic of negative numbers. I feel as if the "story" we were attempting to tell through our choice of primary-level problems deserves a mention in this article and of course I'll throw in a few of the problems themselves too! Before developing ideas based on negative numbers in the classroom, you may find it useful to read one of the articles which was published alongside the problems that month. It is simply entitled Negative Numbers and is a very readable account of how negative numbers became part of the "vocabulary" of mathematicians, in fact only relatively recently. Next, try a more interesting version of the game. This time, use two dice. When it is your turn to throw, you can decide which dice number to use. In this game, you must land exactly on the end of the drain pipe to win. Perhaps you can make up your own version of the game? Please send in your ideas and other people can try them out. What makes your game good to play? This makes the game a higher-level challenge as children now have to make decisions as to the number of places which would be best to move rather than just relying on chance. Is it better to play a game where you have to reach the end exactly, or where you can go over the end? What do you think and why? This game also specifically links the ideas of addition and subtraction to the number line with the use of the "plus" and "minus" vocabulary. 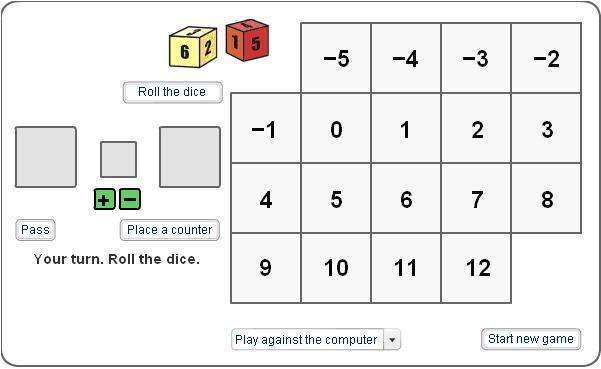 Once again, the game then goes on to suggest making some changes - allowing children to add or subtract the two numbers on the dice. In this case, higher-order thinking is required not just for decision making, but also for investigating all possibilities. Before playing the third game in the series with children, try the investigation Swimming Pool which is also from the January 2008 site. 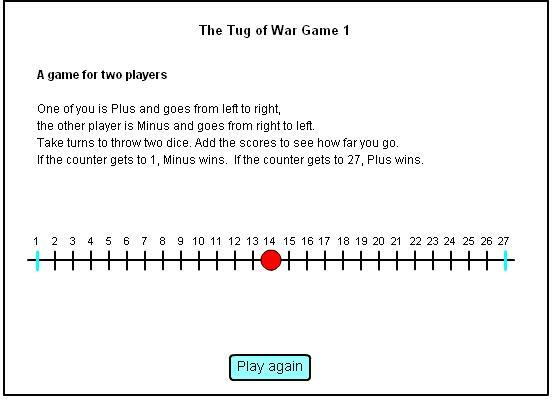 The problem addresses a similar idea to the Tug of War game, as it requires children to count in different directions on a number line. The only difference is that in the case of Swimming Pool, the line is vertical and not horizontal. The final part of the activity encourages children to be creative and invent their own way of numbering the steps below the water level. This will undoubtedly provide some interesting points for discussion amongst the whole class. You may want to share a few of their ways with everyone, asking the relevant children to explain why they think their way works well. There could be some debate about which ways might work best. At that stage, you could specifically introduce negative numbers if they have not come up already, for example through the vertical number scale of a thermometer. It would be great to have a thermometer to hand and then you could look together at the negative parts of the scale, talking about what they mean. You could then transfer this negative number scale to the swimming pool. 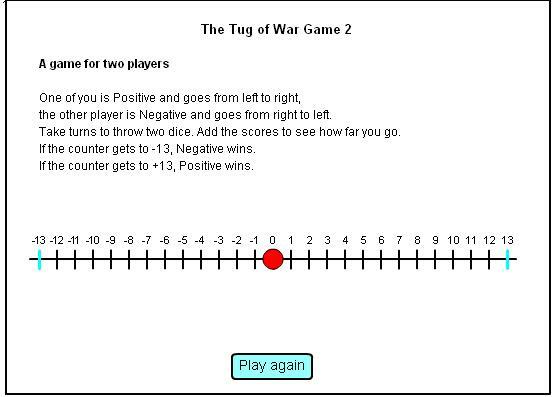 The version as in the image is played in exactly the same way as Tug of War, but this time the extended number line is used so that children become happier with the relationship between positive and negative numbers. The second version again takes the game to a higher level as pupils are this time asked to use any operation to manipulate the numbers on the dice so they will be making decisions as to which calculation to perform and why. These same skills are needed in yet another game on January's website First Connect Three. In this game the winner is the first to complete a row of three, either horizontally, vertically or diagonally. Players take it in turns to roll the dice, place each dice in one of the squares and decide whether to add or subtract to produce a total shown on the board. The total will then be covered with a counter. 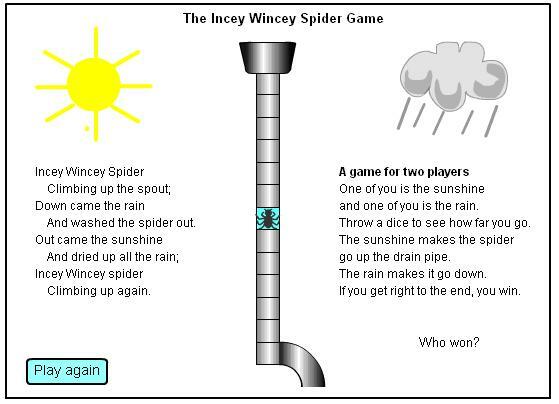 This game is a great way for pupils themselves to take responsibility for their own learning. An individual can avoid negative numbers if not confident or he can push himself to calculate negative answers. In analysing the game more fully, rather than just playing it, the idea is for children to develop a system for finding all the possible ways of making each number on the grid so they can justify which is the easiest to get. This would then lead to a discussion about how it would affect the way you play the game to win. A teacher I was working with in Haringey, London, described to me how she had used this game with her low-attaining Year $5$ class. She began by playing herself against the computer, talking through her thinking processes out loud. By using the number line she has as a permanent feature in her classroom (which extends back beyond zero), she looked at the possibilities for each throw, counting on or back along the line depending on whether she added or subtracted. When the result was a negative number, the children took it in their strides without any difficulty as they understood the processes occurring. This meant that when they came to play against each other in pairs and began to think about the strategies involved, the calculations became straightforward as they too used a number line. By the time they are in Year $6$, the Framework suggests that children should also be able to "Find the difference between... two negative integers, in context". The Swimming Pool context could easily be used as a basis for exploring this, as could Sea Level, the last of the January 2008 resources at primary level. By using the images in these problems, what could be a tricky concept becomes very manageable. I would also urge you to take a look at the Key Stage $3$ resources published in January 2008 which may help you to see where negative numbers go next! I hope that, whichever year group you teach, you and your class will enjoy these negative number resources. Do remember that you can also search for other relevant problems using the "Search by Topic" in the right-hand corner of the website and all January 2008's material can be viewed by selecting the appropriate month in the "Past Issues" link.